The City of Sonoma was fortunate to escape direct damage from the 2017 fires. We are extremely grateful to all the emergency responders - local, regional, national, and even international - who worked together to save our town. Sadly, many of our neighbors in Sonoma Valley and Sonoma County were not as fortunate, with homes and businesses lost or damaged in the hills above town, the eastern edge of the Valley, and the communities of Glen Ellen and Kenwood. At final containment, the Nuns Fire had comprised more than 56,000 acres and destroyed more than 400 Sonoma Valley homes. 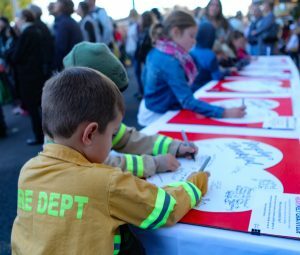 As the one-year anniversary of the October 2017 wildfires approaches, remembrance events are being planned throughout Sonoma Valley. This is a list of some of those gatherings and events taking place in Sonoma Valley. Please email stracy@sonomacity.org to request that your event be included on this list. To see a list of remembrance events in Sonoma County, please visit the Sonoma County Recovers website.